With the fully integrated approach we use at KPS, it makes very little sense for guided reading to be completely separate from anything else we are doing in literacy. It is also sometimes difficult to find a book that suits our purpose. We may be looking for a book on a certain theme or the genre of writing we are teaching. We might also want a book that focuses on a certain sound or certain topic words. Perfect Solution - create your own reading books for the iPads! You can create amazing interactive iBooks using iBook Author on a Mac. These books can contain review questions to assess comprehension as well as many other features. They take a bit of time and effort to get the hang of at first but are quite simple once you work iBook Author out. Another option is to use an app on an iPad such as Book Creator. 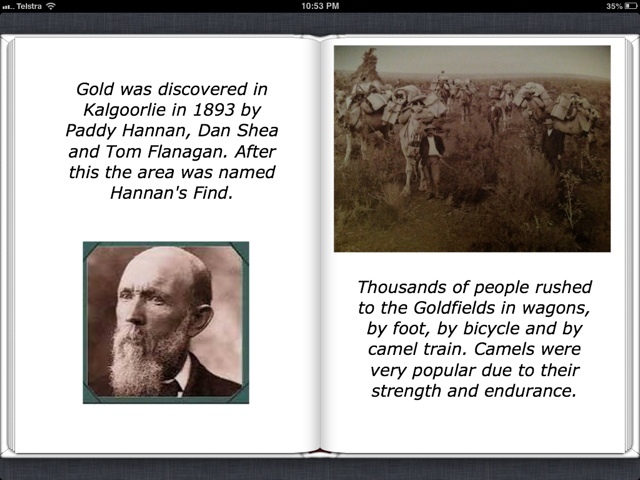 With book creator you can add text, pictures, movies and audio. This app is really quick and easy to use. Books can then be sent to iBooks. They can also be shared with other iPads either via email or through iTunes. If you use the Book Creator option you could still develop comprehension questions using Socrative. Below are screenshots of two books I made last year to match my theme. The first one was for a low student and was fully narrated. The second one was for a higher group and wasn't narrated.